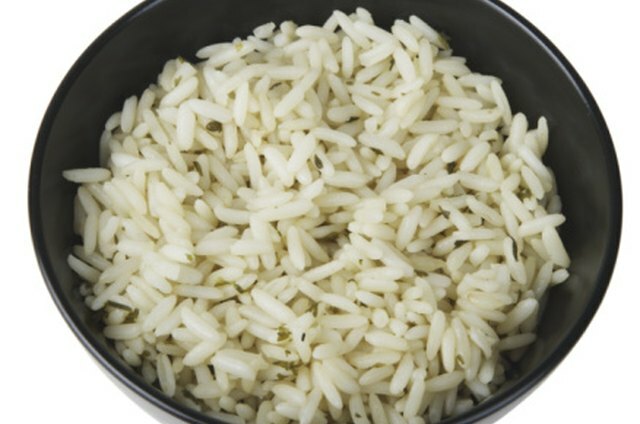 Rice is a popular dish that is often served at meals throughout the world. Cooking rice fast does not require a lot of practice or experience, just a bit of "know how." Although there are traditional methods for cooking rice, some methods allow you to cook rice in less than 30 minutes on the stove and less than 10 minutes in the microwave. For additional flavor, add other ingredients to your rice such as meat, vegetables or spices. Pour 4 cups of water into a 4 quart sauce pan and bring it to a boil over a medium heat setting. Add 1/4 cups of margarine or butter and 2 teaspoons of salt to the boiling water. Stir in 4 cups of rice and cover the pot. For every cup of rice you use, pour in 1 cup of water (4 cups rice = 4 cups water). Reduce the heat and cook the rice for 20 minutes or until it absorbs the water. Keep the lid on the sauce pan to prevent steam from escaping. Combine 1 cup of water and 1/2 cup of rice in a 4-quart microwave safe dish. Add 1/2 teaspoons of salt and 1/8 cups of margarine or butter to the rice and water. Cover the dish and microwave for five minutes on high. Wash the rice two or three times before cooking to remove some to the starch content. Rice triples in volume, so use the proper size cookware for the amount of rice you are cooking. 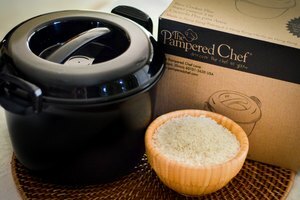 Cooking rice in a pressure cooker can also increase cook time. Use caution when removing the microwave dish to avoid injuries.